There is a well-established argument: arts come from ideas about life. The material embodiment of life goads us to form our concepts of such corporeality. In that process, we attempt to give meaning to desirable things. Poetry is high art. This reality is reflected in Emily Dickinson’s poems while contrasted with Mirza Ghalib’s ghazals. The two portray different cultural assumptions. The poems are made with exact care to fit the personality and worldviews of the poets. 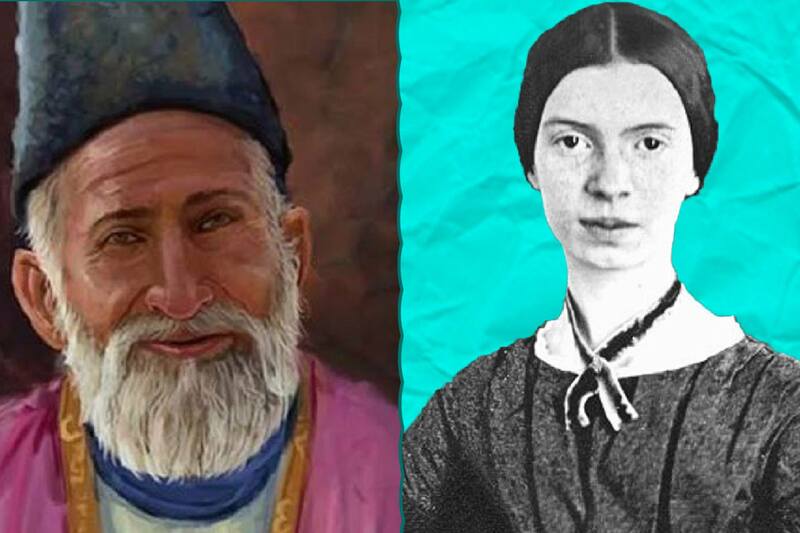 Here, there is a comparison and contrast of the class dynamics in the works of Dickinson and Ghalib linked to a gender analysis. The identity of the persona in Ghalib’s poetry is a male, patriarchal identity. The character is somebody who loves life, is full of joy, and has great opportunities in life. He is well put-together and self-contained: somebody who enjoys the state of romantic love. To illustrate this point, Ghalib, in a couplet, writes, “Many have fallen in love with the slim neck of the decanter / seeing you walk, the wave of the wine trembles with envy” (Ghalib, Ghazal X). This romantic couplet shows the character’s readiness to love, as seeing her makes his hand, even holding a glass of wine, tremble. The deprivation of the poetic voice comes from the outside, from the lack of fulfilling his own desires, and being rejected by his beloved. That could mean, in the identity of the poetic voice, there is no internal sorrow, no internal conflict, and no internal oppression. You can observe. He is not oppressed, silenced, or marginalized by society. There is no sense of melancholy in the character’s voice. The sense of lack is not fundamental. It is not a struggle with identity. However, there is a desire for completion by another person. Someone outside you. They show the capacity and desire of the poetic voice to be engaged in life. But when the beloved does not accept his love, when the love is never fulfilled – the same as the discovery of the oasis as really a mirage in the desert; you cannot catch the person. He will be more and more pursued, which is a sign of engaging in life and love. All of the happiness is something that comes from the acceptance from the other, the beloved – a traditional romantic setting. “Why didn’t I shrink in the blaze of that face? / I flare up, apprehending the gaze that returned that vision unblinded.” (Ghalib, Ghazal X). The ability to love comes from normalcy. Someone normal, or psychologically and physically healthy, is ready to love and be loved. There must be a degree of normalcy in order to engage in romance. Unlike the personae in Ghalib’s poetry, who harvests the benefits of patriarchy, the poetic voice of Dickinson’s, which is a female identity construction, is suffering from the consequences of patriarchy. The character is hopeless, depressed, and the possibility of falling in love is not there because of the patriarchal society. One poetic persona falls in love with death in Dickinson’s poem, “Because I could not stop for death – / He kindly stopped for me-” (Emily, 479). By analogy, it is stopping to pick up your date. Here death is the masculine and the dominant one, she is the feminine one. By the end of the poem, we see their tryst is her burial ground. For the poetic persona, life is exacting and depriving, and a burden. A burden does not bring fulfillment. Additionally, if we look at the text from a feminist view, what the poetic voice is doing is inviting death, it is unlike Gilgamesh. The epic of Gilgamesh goes away from death. The de-familiarization can be taken away from this. Moreover, the poetic persona is internally conflicted. There is no internal peace and reconciliation. To illustrate this point, we can take the poem “My life had stood – a loaded gun,” as an example. In the poem, the narrator, a female, is a loaded gun. Her master is a man. A clear conflict of the ‘I’. The other can be observed in the persona’s voice. Even though, she deals with him as a lover. There is so much anger as well – symbolized by the loaded gun – because the relationship is not a voluntary, egalitarian relationship. That could go into the category of resentment, “a reactive feeling to a sustained and repeated condition of powerlessness of the ‘priestly class’ against the more powerful social class, the ‘noble class’” (Melnikova, 1). According to Nietzsche, the feeling of subordination, being overcome by someone more powerful, led to the creation an imaginary “place,” where these feelings could be cleared away. In this new place, the class of “slaves” is the superior one, while the morality of the other class, called “nobles,” becomes mediocre. The poem appeals to this through deconstruction. The imaginary place where the loaded gun, the slave, becomes the superior one. To illustrate, the poetic persona talks coherently, but it is so antagonistic and unsympathetic to the human experience; there is no capacity at reconciliation with the facts of human life, with the reality that one could experience it. At the end of the poem, the master dies and the gun remains, so that another master can use it. That means, through the imaginarily created place, the self-chosen exile, and deconstruction, the persona is leaving traces for others, so that they do not lose their voice. The cultural assumptions of the Dickinson poem symbolize a restrictive and conservative society, where men have complete power over women. Dickinson’s father was a politician. The political side of the father made him a domineering husband. This reinforced power within the home and forged the personality of his children. The patriarchal theme is connected to one of Dickinson’s desire in her poems. She wants to escape to eternity while describing death, or characterizing her life, as a gun, not as a person who wants to do the same things as men. Another cultural assumption that can be strained out from Dickinson’s poems is the education system in America at the time. Children were educated to think inside patriarchal limitations of society. The imagery of the ride with death in the carriage in front of the school where children saw death while at school time recess, is a portrayal of the education system. On the other hand, Ghalib’s culture is perceived differently. This does not qualify him as someone living in a relatively gender equal society, nor does it signify him as a proponent of equality. Rather, his ghazals inform us about how much the genders were segregated from each other at the time. The union of two lovers is considered an outstanding accomplishment. There’s a divinity theme in most of his ghazals that gives off a sense of religiosity. Imagination and the will to life are imputed to a divine being. A being presumed to have answers for the confusions that come from love, life, and the passions. Another cultural assumption might be socioeconomic class privileges. That somebody is care-free in their social life, ready to love, and able to be fully committed in this romantic pursuit. It implies socioeconomic class privileges. There are freedoms associated with these privileges, which allow romantic pursuits in life. Poor people tend to be limited in their free time, so limited in their ability to pursue love and life in a larger sense. The rich have a different, greater set of opportunities in life, generally. This is true for Ghalib. For him the pursuit is sensual, sensuality is the desire to be sensually fulfilled; it is a sense of satisfaction and fulfilment. However, there are privileges in Dickinson’s poetic personas, but the pursuit is more intellectual. The satisfaction is completely out of the picture in Dickinson’s poetry. The possibility, the hope is not there; the lack and the internal conflict is fundamental in a way that the persona cannot immediately accept the completeness through others – because there is this radical sorrow, that never leaves, that is so defining. Nietzsche thinks that class privileges give them a certain morality. For example, poor people think that humility, meekness, charity, and honesty are “good.” This conception of good is formed because they only can do such actions, while the top classes have another view of good and bad. Therefore, Nietzsche thinks that humans have a will to power in which their moralities will change with it. Your privileges are the reflection of your will to power and how much of that will turned into results which are embodied in privileges. Melnikova, Eva. Nietzsche’s Morality of Ressentiment. Filisof Magazine, Fall 1, 2010. Print. Nietzsche, Friedrich. On the Genealogy of Morals. Oxford University Press, 1999. Print. Dickinson, Emily. The Complete Work of Emily Dickinson. Little, Brown, 1976. Print. Ghalib, Mirza. Mirza Ghalib: Selected Lyrics and Letters. New Dawn Press, 2005. Print.